Mollie is a 9 month old kitten, and is mostly back with a little white on her neck. She was brought into the vet by a good Samaritan. 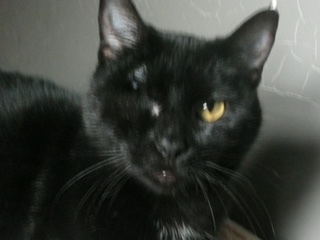 Mollie was missing her right eye and was already pregnant at such a young age; however a few weeks later she had a miscarriage. She is up-to-date on shots, altered, Leukemia and Aids negative. 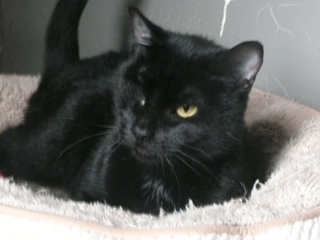 Mollie is a very sweet and loving little girl. She has been around other cats and dogs and didn’t take long to adapt to her new surroundings. Mollie loves to be cuddled and kissed. She would be a great companion to any family.